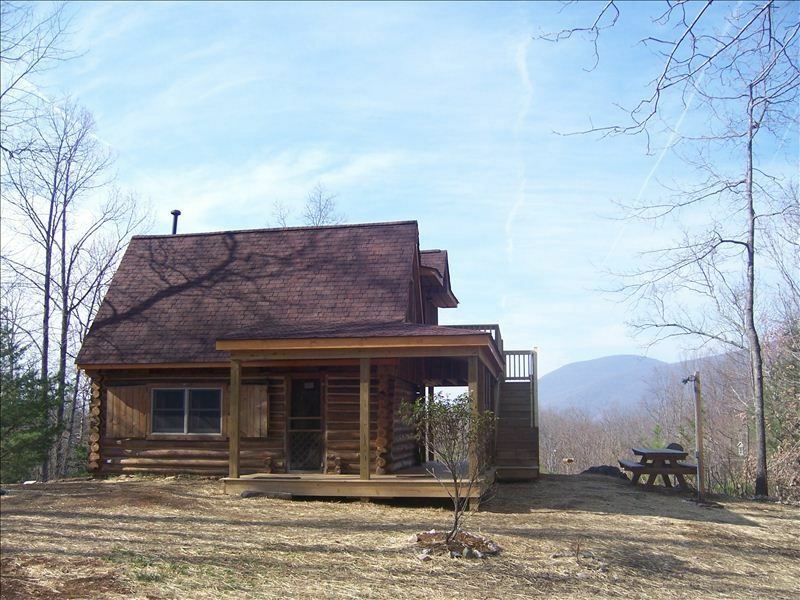 Afton Log Cabin Get-Away is nestled in the foothills of the Blue Ridge Mountains in Afton, Nelson County, Virginia, just 10 miles from I-64 between Charlottesville and Waynesboro. Cozy, quaint, and secluded on 12 wooded acres, Afton Log Cabin is an authentic log cabin built in the late 1960s using Poplar trees growing on the property. Vineyards, breweries, and cider houses conveniently located in the surrounding area. The first floor is a family room with bathroom and kitchenette. The bathroom has a toilet, sink, and shower. The kitchenette is fully equipped with dishes, utensils, pots/pans, and a stovetop Corning Ware coffee maker. Coffee, tea, creamer, and sugar are provided for guests' convenience. Paper products are supplied in the bathroom and kitchen. The Loft has two sleeping areas with double and twin beds. The Blue Ridge Room on the second floor with queen bed is accessible from both the loft and a private entrance from the balcony and steps that lead to the yard. Lawn chairs are provided on the balcony for guests to relax and enjoy the beautiful vistas of the Blue Ridge Mountains. The wrap-around porch and large rear porch with picnic table and Adirondack chairs enhance the livability and enjoyment of the cabin. Hammock, swing, fire pit/grill, and walking trails extend the fun into the spacious yard and hills surrounding the cabin. There are Wi-Fi, satellite/Direct TV/VCR combinations in the family room (DVD), Loft (VHS) and Blue Ridge Room (DVD). Be sure to bring your favorite movie and some CDs so you can relax to your favorite melodies on the CD player in the Blue Ridge Room. If you enjoy snuggling up to a good book, take your pick from more than 50 books in the Loft. Afton Log Cabin is only 15 minutes from Wintergreen Resort, 20 minutes from Waynesboro, and 25 minutes from Charlottesville, Staunton, and Lovingston, the county seat of Nelson County. Vineyards, breweries, cideries, parks, hiking trails, restaurants, antique shops, churches, museums, and historical and cultural points of interest offer guests a wide range of things to do. Whether you are looking for a place to get away from it all or a place from which to enjoy your favorite pastime, Afton Log Cabin will capture your heart. Please note that quoted rates are based on guests bringing their own linens. However, Linens may be provided for an additional fee based on the number of bed linen sets and towel sets needed. No photo available of property owner. In the 1960s, we visited Nelson County and fell in love with the beautiful mountains and picturesque countryside, the farms, ponds, and people. Not long after, we bought property in Afton and built a log cabin using the Poplar trees growing on the property. Single shower, sink, and toilet. Quoted rates do not include linens (sheets and towels) because some guests prefer to bring their own. However, linens can be provided for an additional fee based on number of sheet and towel sets needed. Downtown Mall in Charlottesville is a popular place for shopping, browsing, and dining. Virginia Beach is about 200 miles away with incredible beaches and surf. Wintergreen Resort for skiing, golfing, tennis. Scenic farmland with horses, farm animals, and country homes perched on rolling hills and mountainsides. Beautiful view of the Blue Ridge Mountains from the cabin, especially from the balcony and rear covered porch. Wintergreen Resort offers skiing and snowboarding. Sanyo Split System central air with remote control and gas log heater. Propane gas log heater. Gas and Carbon monoxide detectors downstairs and upstairs. Linens are available as an additional fee based on the number of sheet and towel sets needed. Cabinet height refrigerator/freezer in cabin and an extra cabinet height refrigerator/freezer in the shed. Electric range/oven and microwave for cooking. Some spices, coffee, tea, sugar, creamer provided. In case you want to try a new recipe, take a look at the Ranch House cookbook provided. 3 TVs in family room, master bedroom (Blue Ridge Room), and Loft. Fire pit/grill, a 2nd picnic table, and hammock. Enjoy view of mountains from two lawn chairs provided. Large rear porch has a picnic table/benches and some lawn chairs. The spacious yard has a picnic table, hammock and fire pit/grill. What a beautiful view! I sat on the back porch which over looked the mountain side and did homework. I could have sat there all day. This cabin was built with love, you can see it in every log, every wall, and door. The craftsmanship is stunning. The cabin is warm and cozy and I felt very safe the entire time I was there. I do not have a four-wheel drive and was worried about the mountain but, it was perfectly easy to get to. My host was wonderful and the cabin was exactly as described. Directions for the heaters and TV were easy to find. The bed was comfortable and clean and the shower was hot! I was five miles from Blue Mountain Brewery, the food there was great and Charlottesville is an easy 30 minute ride. I spent the weekend at the cabin and at Magpie Knits, I was in Heaven. Thank you so much for having me! As peaceful as it gets. Very quiet, cozy, private cabin. Though it has 3 beds in the loft, I would say this is more the perfect couples cabin. Many amenities provided, such as a fully stocked kitchen. Pots pans dishes, coffee maker and coffee etc...The fire pit is perfect, and they supply plenty of good firewood! (Big plus for me) The location is perfect. If you want to sit and enjoy the peace and quiet you can. Or, enjoy many outdoor activities in the area. Potential drawback about the cabin is the shower. It is about the size of a phonebooth. The glass door opens to hit the sink, leaving a tight squeeze for an average person to enter it. Something I would rethink if I were the owner. FEES: damage deposit is expected...Cleaning fee is expected (should you not leave the place as you found it.) I was a bit put off by the $50.00 linen fee. You can bring your own linens (Sheets, pillow cases towels, they provide blankets.) or pay an extra $50.00 for them to provide linens. I would just build the linen fee into the overall price so the consumer doesnt have to worry about it. But, thats just personal preference. This cabin still gets 5 stars because of the peace and quiet it provides and it'soverall charm. This was by far the best one of the BEST get away locations. The cabin is very charming and really embraces cabin living. The surroundings are just as wonderful! You have to try Paulie's BBQ (looks are VERY deceiving)! The Rockfish Gap Country Store is a gem! So many cool things and fantastic apple butter!. We visited the Bold Rock distillery and had such a great time. Ms. Woo was a phenomenal host and we will definitely be going back soon! The cabin had everything our family of 4 needed- was very well equipped. We really enjoyed bonfires as the sun was setting over the mountain, then watching the stars come out. It was the perfect location for us between Charlottesville and Wintergreen ski resort for skiing and tubing. Jeannie was very accommodating and helpful! Very cozy. Loved that it was a true cabin in the woods with a great view and fire pit. It was perfect get away for our small family. Enjoyed the hike and loved the visit to the local breweries....most of all, relaxing!!!! Afton Log Cabin is located in the foothills of the Blue Ridge Mountains 20 miles west of Charlottesville and 15 miles east of Waynesboro, Virginia, near Interstate-64 and Route 250. The surrounding area is a rural patchwork of farms, meadows, woods, and meandering rivers and streams. Quoted rates are based on guests bringing their own toiletries and linens (sheets, towels); however, linens may be supplied by owner for an additional fee based on the number of sets needed.